Experience an unforgettable cruise with timeless elegance and unbeatable comfort aboard the luxury Seven Seas Splendor. 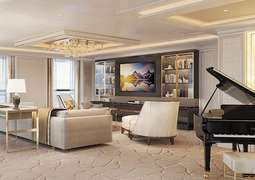 The premium liner has exclusively suites with balconies, with 10 distinct variants to suit your needs, featuring living rooms, marble and stone bathrooms, walk-in closets, personal butlers and more. Elegance, style, timelessness, spaciousness and attention to detail are all descriptors that come to mind when referring to this vessel. On the Seven Seas Splendor suites range the 28m² Veranda Suite, all the way up to the 412m² Regent Suite. The contemporary interior is elegantly designed and intended to relax its occupants - bright and spacious with sleek furnishings and elegant decor, along with every amenity you need to ensure your temporary new home is truly your own personal retreat with all the comforts of home - and more. 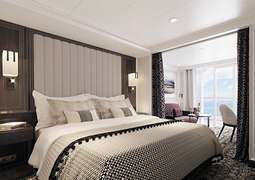 The staterooms' lavish bathrooms are furnished with marble and stone and create a place of rest and relaxation, stripping back on intense colors. After a busy day of shore excursions you can easily switch off from the hustle and bustle in your spacious and stylish personal space. The Seven Seas Splendor, as you would expect, offers culinary masterpieces by world-class chefs in multiple restaurants onboard. Whether you fancy a quick bite for lunch, or an extensive seven course evening meal, Regent's chefs will prepare works of art, mingling flavours, textures and colours to compliment wines hand-selected by sommeliers. Many different variations of grilled specialties are showcased in the pool grill, while French cuisine can be enjoyed in the restaurant "Chartreuse". Among the total of 8 different gourmet restaurants you will also find a specialty restaurant and a chic, metroploitan café where you can enjoy everything from the perfect latte macchiato to your favorite cake or pastry. A diverse program on board will provide entertainment and variety. Enjoy exciting theater performances or spend your evening trying your luck in the casino. For those who want to end the day in a more relaxed setting, the Splendor Lounge and the Observation Lounge offer a pleasant atmosphere with exclusive live music. Access to the internet is always available in all areas aboard the Seven Seas Splendor. Boredom simply does not exist on a Regent Seven Seas cruise. The library is an oasis of peace and tranquility where you can enjoy time to yourself. In contrast, the pool deck provides more action. There are also stimulating cooking classes offered, which you are welcome to attend. The boutiques on the Seven Seas Splendor invite you to shop at your leisure. With a glass of champagne in your hand, explore a selection of specialty stores hosting a well-stocked collection of fashion brands. For exclusive occasions or gifts for home, you also have the opportunity to purchase jewelry and watches on board. There's a relaxed atmosphere aboard the Seven Seas Voyager. During the day it is advisable to wear casual clothes for shore excursions and on board. As the Seven Seas Splendor is a luxury class of cruise ship, formal wear is appropriate for the evenings.